I've made clear my abiding love for creamy, cool summertime pies. This here is one of my favorites. It's not quite as rich as a chocolate cream pie, and there's a little more to it than a key lime pie - but it's still spring-timey and light. This recipe incorporates a little bit of chocolate, which - to my mind - is a perfect complement for vanilla pastry, bananas, whipped cream, and just about everything else. I like to make this pie - like most pies - in a 10" tart ring. It's the same amount of trouble as a 9" pie, but it feeds about twelve people instead of eight. But since I imagine most people will be using a traditional 9" pan, I'll give the smaller-sized recipe first. The shortening or lard in this crust makes it tender; the butter gives flavor. In a food processor (or in a bowl, with a pastry blender), pulse together flour, salt, and sugar. Add butter and shortening or lard, and pulse (or work lightly with pastry blender) until the largest lumps are about the size of large peas. With the food processor running, add water in a steady stream just until the mixture begins to hold together. If not using a food processor, toss the mixture with a fork to incorporate the water. Shape the dough into two disks. Wrap tightly in plastic and refrigerate for at least one hour, or up to three days. Or place in a freezer bag and freeze for up to a month. To blind-bake for a single-crust pie, roll out one disk onto a lightly floured surface, to about 1/8" think and 11" diameter. * Place a rolling pin in the center, and gently fold each side of the dough over the pin. Place the pin over an ungreased pie plate, gently unroll, and fit the dough into the plate. Trim the overhang to 1" wide, and fold the edges of the dough under themselves. Crimp with fingers or a fork. Prick all over with a fork (so steam escapes from under the dough when baking), and refrigerate for at least 30 minutes. Bake in preheated oven for 20 minutes, then remove from the oven and carefully remove the parchment and pie weights. Be very careful - the parchment often tries to take layers of the half-cooked dough with it. Return, uncovered, to the oven for 15 minutes more. Check it halfway through; if the edges of the crust seem to be getting too brown, cover them with aluminum foil. When done, let cool on a rack before filling. *If it's hot, I use two pieces of parchment paper to roll out dough. Lay the dough disk in the center of a piece parchment, and roll your rolling pin out from the center of the dough. Flip the dough over every couple of roll-outs (using your hand, a spatula, or a cake mover) to keep it from sticking to the parchment. Once the dough is too warm and sticky to be easily flipped, place it, with parchment, in the fridge. After fifteen minutes or so, it should be cool enough to continue rolling out the rest of the way. Lay the other piece of parchment on top, flip it over, and roll out to 1/8" thickness. Sometimes I place 1/8" wooden dowels - from the hardware store - under my rolling pin to make it easy to get an even thickness. **I used to skip this step, because it frustrated me so much when the dough stuck to the parchment - I've had to repair many, many pie crusts because of this. If you're using a regular 9" pan, and you don't care too much if one or two sides of your crust slip down into the pan, then don't worry about it. But I've realized that it's crucial to a straight-sided pie made with a tart ring. Just be very slow and deliberate when you remove the parchment halfway through baking. Place the chocolate in a medium bowl. In a large (2-cup or so) glass bowl or measuring cup, heat the cream in the microwave just until barely boiling. Remove immediately, and pour over chocolate. Swirl to coat, and let sit for five minutes. Whisk in the center of the bowl until mixture is smooth and blended. Pour into cooled pie crust. Let cool until ganache is firm. 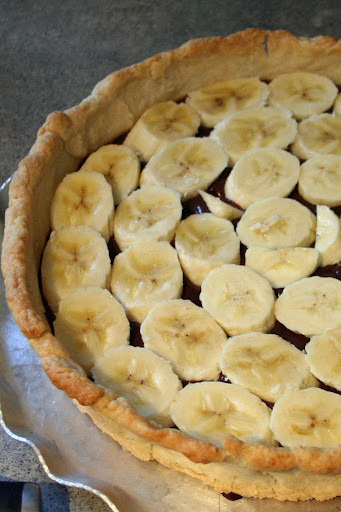 Slice bananas diagonally, and arrange in a single layer on top of the ganache. Bananas will begin to brown, so make the custard immediately. In a large bowl, whisk egg yolks together. In a large saucepan, whisk sugar and flour together. Slowly whisk in milk until blended. Over medium heat, heat milk mixture until it comes to a simmer, four or five minutes. A quarter-cup or so at a time, pour about two cups of the hot milk mixture into the egg yolks, whisking the yolks constantly. Pour in the rest of the milk mixture, still whisking. Pour the milk-yolk mixture through a fine sieve back into the saucepan (the sieve will remove any bits of egg that didn't get tempered correctly). Continue to heat, whisking constantly, until mixture thickens and large bubbles just begin to appear when you stop whisking. Remove from heat, whisk in butter and 2 teaspoons vanilla, and continue to whisk for two minutes. Pour custard over ganache and bananas. Press a piece of plastic wrap directly onto the pie filling, and place in refrigerator until completely set, about three hours. Filling should be the consistency of firm pudding. When pie is set, whip heavy cream with an electric mixture until soft peaks form. Add powdered sugar and 2 teaspoons vanilla, and continue to whip until firm peaks form. Spoon whipped cream over pie when you lift off the plastic wrap; otherwise a skin will form on the custard. I used a large leaf tip to pipe on whipped cream. Wait until the pie is completely set before you remove the tart ring. I am NOT making that mistake again. Vanilla custard is not an effective spackling compound. I want some of this Right Now!